Resilience is the ability of a city to bounce back from an unforeseen catastrophe. Resilient cities are able to snap back to their previous state after a disaster and even develop the capacity to withstand future shocks. Knowing what to do prior to, during and after a disaster is critical to the recovery and resilience of a city. While significant attention has been paid to disaster recovery in recent years, the prolific research that has been published on the subject has been in disparate journals and books, each appealing to the interest of a particular profession. 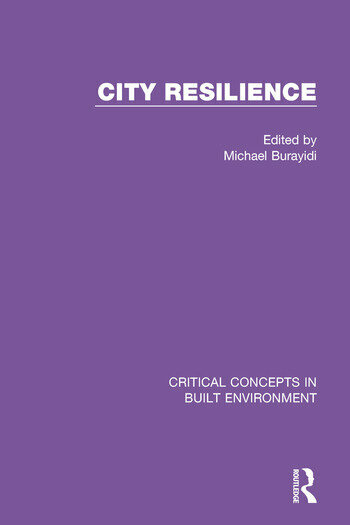 This four volume series rectifies this problem by bringing the work of leading thinkers on the subject and the most influential research on city resilience into one document that is readily accessible to researchers. The editor provides an introduction for each of the four volumes synthesizing the articles and identifying the essential message conveyed in the volume. Michael A. Burayidi is Irving Distinguished Professor and Chair of the Department of Urban Planning at Ball State University, Indiana. He is author of Resilient Downtowns: A New Approach to Revitalizing Small- and Medium-City Downtowns (Routledge, 2013), Downtowns: Revitalizing the Centers of Small Urban Communities (Routledge, 2001) and Urban Planning in a Multicultural Society (Praeger, 2000).